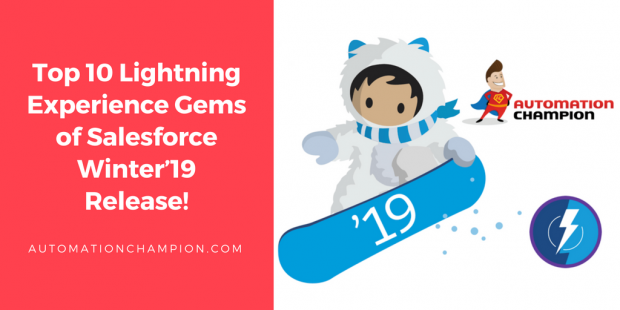 Top 5 Lightning Component Gems of Salesforce Winter’19 Release! The Lightning Component modern framework is a User Interface framework to develop dynamic web apps for mobile and desktop devices. As is the case with each release, the latest Winter‘19 release is packed with rich features including, the newly added Lightning Component features! Currently, Winter’19 release is available under the pre-release program. On the 7th and 8th of September, Sandboxes will be upgraded; as a result, your organization will get the look and feel of Winter’19 release. If you have not read the entire 470 pages of Salesforce Winter’19 release notes yet, check out Winter’19 release quick summary and, the Top 10 Lightning Experience Gems of Salesforce Winter’19 Release! written by me. I combed through the release notes and highlighted the added capabilities to the Lightning Component features. Believe me, it was hard to stop at just five! To kick things off, here is my take on the coolest Lightning Component features from Winter’19 release. 1) Build Exciting User Interfaces with New Base Lightning Components:- Now you can accelerate your development with a fresh medley of new built-in Lightning components. The new components cover a broad range of user interface elements and give you a whole new tool bag for your development. Following are few of the new component features. Please note that these features require API version 44.0 or later. a) lightning:map: – The lightning:map component securely displays a map of one or more locations using Google Maps. You can pass markers to the component to define the locations to map. A marker can be a coordinate pair of latitude and longitude, or a set of address elements: City, Country, PostalCode, State, and Street. Following screenshot display the map component with one address. b) lightning:menuDivider: – The lightning:menuDivider component is used as a child component of lightning:buttonMenu. Use lightning:menuDivider to create a dividing line after a menu item. By default, space is added above and below the divider. Use variant=”compact” with lightning:menuDivider to reduce the space. 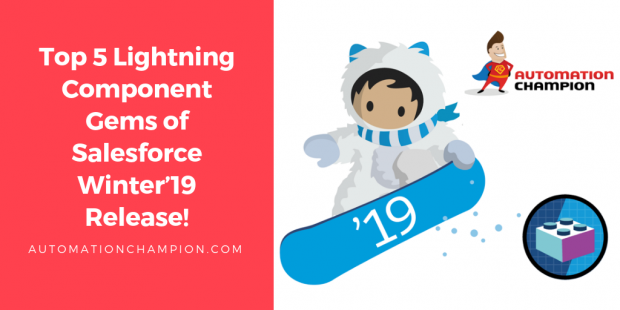 Top 10 Lightning Experience Gems of Salesforce Winter’19 Release! With each new release, Lightning Experience is getting sophisticated and robust. It is now faster, quicker and easier to maintain. If you are still using Salesforce Classic user interface, Winter’19 release will give you hundreds of reasons to switch to Lighting Experience. If your users are frequently switching to Salesforce Classic, now you can prompt a form to your users for feedback when they switch back to Salesforce Classic. Some of the key features, that are now available in Lightning, include – View Page Performance by Browser and Other New Metrics in the Lightning Usage App, External Objects Now Supported in Lightning Console, Forecast Sales by Territory (Generally Available) and See Your Email Impact with Email Tracking, etc. If you have not read the entire 470 pages of Salesforce Winter’19 release notes, check out Winter’19 release quick summary written by me. I combed through the release notes and highlighted the most exciting, interesting, and useful Lightning Experience features. Believe me, it was hard to stop at just ten! To kick things off, here is my take on the coolest Lightning features from Winter’19 release. 1) Schedule Event Series (Beta):- Now onwards your reps can schedule daily, weekly, monthly, or other repeating events from Lightning Experience and the Salesforce app. Read the rest of this entry!